Bert, an electrician, and Bill, a London Underground porter both fall in love with shop worker Nell. But when Nell chooses Bill, Bert resorts to devious tactics. The social spaces of 1920s London (parks, pubs and shops) play an important role in Anthony Asquith 's working-class love story. 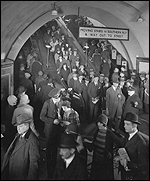 Most central to the narrative of the film, as the title suggests, is the London Underground itself, its bustling public corridors and carriages providing an arena in which people from all walks of life intermingle. The atmosphere of the Underground is immediately conveyed in the documentary-style opening shot of the film, as the camera, mounted on the front of a train, approaches a crowded platform. Once inside the carriage the tone shifts to comedy as the passengers, a cross-section of metropolitan society, are surveyed. The rakish Bert ( Cyril McLaglen ) pokes fun at a well-dressed businessman; shop girls gossip excitedly, to the dismay of the prim lady sandwiched between them; and Nell ( Elissa Landi ) scores a minor victory over Bert by tossing his hat into the midst of a group of mischievous schoolboys. Although Underground was only Asquith 's second film (and the first for which he would receive a full directing credit - Shooting Stars (1926) was officially credited to veteran director A.V. Bramble ), he handles the melodramatic story with sophistication. As in Alfred Hitchcock 's The Lodger (1926) and Blackmail (1929), the psychological aspects of the narrative are illustrated with imaginative touches that draw upon a variety of European cinematic influences such as German Expressionism and Soviet Montage. The sharp angles and dramatic interplay between light and shadow outside Kate's ( Nora Baring ) room are indebted to expressionist techniques, and create a visually striking scene while conveying something of the young woman's confused mental state. Asquith also admired E.A. Dupont 's use of the camera to create a subjective viewpoint, in films such as Varieté (1925). Asquith utilises this approach during the pub fight between Bert and Bill ( Brian Aherne ), with Bill launching his fist directly at the camera as he strikes his final blow. As Bert retreats home the punch is replayed over and over in his mind, the editing of the sequence building to an emotional crescendo as he resolves to take revenge. Asquith continued to explore the potential of film to create mood and to convey emotional states, which arguably reached a high point in the experimental shot juxtapositions and rapid editing of his final silent film, the celebrated A Cottage on Dartmoor (1929).